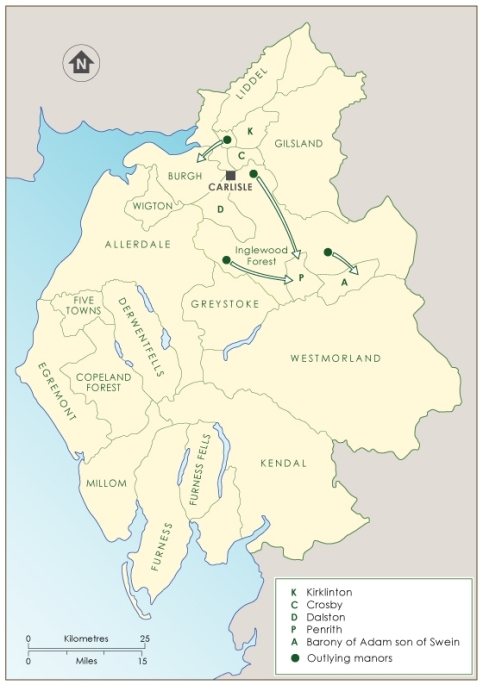 Historically, Cumbria was divided into large baronies and superior lordships, as shown in the map below. Click on the map to go a brief description of each major unit of superior manorial jurisdiction. Alternatively, use the County Directories below. Original records and archive guides in Cumbria Record Offices and Durham University Library, Archives and Special Collections Department. Furness, William ('Ewanian'), History of Penrith from the Earliest Record to the Present Time, Penrith: 1894. Jefferson, Samuel, The History and Antiquities of Leath Ward, in the county of Cumberland, Carlisle: 1840. Jefferson, Samuel, The History and Antiquities of Allerdale Ward, above Derwent, in the county of Cumberland, Carlisle: 1842. Nicolson, J., and Richard Burn, The History and Antiquities of the Counties of Westmorland and Cumberland, Wakefield: 1976 reprint of 1777 edition. Owen, Hugh, The Lowther Family: Eight Hundred Years of 'A family of Ancient Gentry and Worship', Chichester: 1990. The Victoria History of the County of Lancaster, edited by William Farrer and John Brownbill, Vol. 8, Folkestone: 1993. Thomas Denton: A Perambulation of Cumberland 1687-1688, edited by A. J. L. Winchester in collaboration with M. Wane, The Surtees Society and Cumberland and Westmorland Antiquarian and Archaeological Society, Vol.207, 2003. Whellan, William, The History and Topography of Cumberland and Westmorland, Pontefract: 1860. Contact Details: Department of History, Lancaster University, Lancaster LA1 4YG, UNITED KINGDOM | Email: history@lancaster.ac.uk | Tel: +44-1524-593155| Fax: +44-1524-846102.